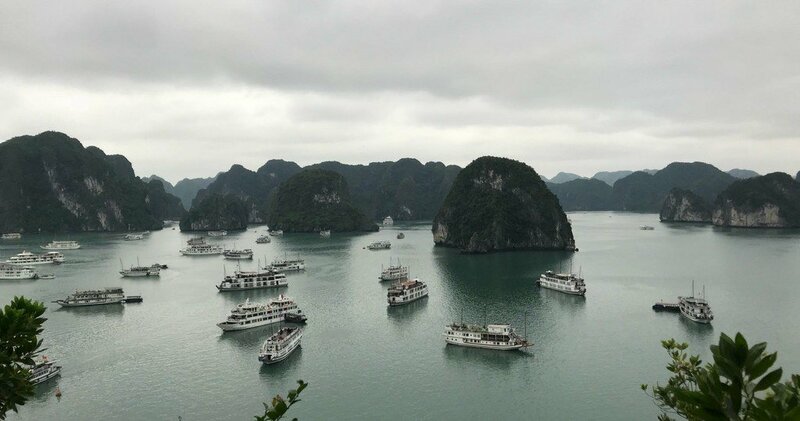 » Halong Bay Cruise – a must do Vietnam experience. Halong Bay Cruise – a must do Vietnam experience. Over the 3 days there were opportunities to do early morning tai chi, squid fishing after dinner, cookery classes before supper, kayaking, swimming and plenty of climbing stairs to visit caves. Most of the Halong Bay cruises start from the Tuan Chau jetty. After being picked from our Hanoi hotel at 7:30 am we drove around collecting other guests until we finally left Hanoi left at about 8 am. The 160 kilometre drive takes about 4 hours including a half way stop at a craft centre for the disabled. There were many local products and some craftsmen working to produce others. The roads are not in a great condition, there are many towns along the way and there's traffic. When we set off it was overcast and drizzling and the forecast predicted that the days ahead would be getting colder and wetter. We arrived at the jetty and were astounded by the number of cruise vessels ​lined up waiting to launch. It was unbelievable. After the check in formalities we boarded the ferry and set off. ​There was a short safety briefing after which a delicious lunch was served. This was the start to a few days of very indulgent eating. ​After tranfering to the small day cruise boat the first attraction we visited was Ti Top Cave. The area unpleasantly overcrowded by mobs of Chinese visitors pushing and shoving their way up and down the stairs. There is a small beach and if you were prepared to brave the cold you c​an swim here. From ​Ti Top it was off to the Tung Sau area where we kayaked and learned about the cultured pearl production process. It was cold and windy and it was a relief to get back to the ​ferry. ​After a short ride it anchors for the night ... surrounded by a fair number of other cruise ferries. Each evening before and after supper there are "happy hours". But with the price of drinks on board these are still excessive. ​The next morning was an early start with breakfast at 7 am. It was still raining, windy and chilly as we transferred to day cruise boat. ​Our first stop was the Cua Van Floating village. Here there was another opportunity for kayaking. The weather was horrible so we took the easy option of being skulled around the village by ladies on tiny rowing boats. After lunch (another delicious meal) we visited the Me Cung Cave which is on an island with an inland lake. After getting back to the main ​ferry there was another evening of happy hour and a delicious meal. After another early start we visited the Hang Sung Sot or Surprise Cave. This cave is enormous and again there were many visitors. A solid stream throughout the 2 kilometre slow walk through the cave. After that it was brunch and back to the jetty to disembark from our most enjoyable Halong Bay Cruise. We had decided that we would go from here to Cat Ba Island and use our transfer return trip to Hanoi a few days later.